Our members call this the most fun way to burn fat, period. 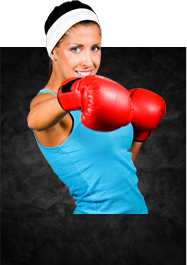 Drop inches, tone up from head to toe, and learn some self-defense too as your body gets slim ‘n toned. Here’s how we get you such awesome results, and how you can get started as early as today! Combine all three… and you’ve got one heck of an awesome, fat-burning workout. There is nothing… NOTHING… more stress-relieving than hitting a punching bag. Whether you’re coming to kickboxing class after a long day of work… or you’ve been dealing with the kids and the spouse all day and need a break… as soon as you get started the stress will ooze away. You’ll quickly master how to kick and punch in the most effective way. It feels GOOD to look in the mirror and love what you see. If everyday you look in the mirror.. and see things you don’t like… that negative energy carries into every area of your life. When you call and sign up right now, you can get started with A FREE CARDIO CLASS! No strings attached. That way you can see if our classes are right for you. This special is only available through our website, and will only be offered for a limited amount of time! Imagine how that positive energy would fill your day – and how you would bring it to others too. It could happen – and very quickly too. In fact, I see people feeling better and better about themselves every week with our kickboxing classes.